Universal’s “gainer” protein powder is finally here in Animal Mass. Helping you eat like a beast to get HUGE! Universal Nutrition has been in the supplement game a long, LONG time. Their Animal line of products is geared for those individuals who need to unleash their inner beast and to do so, you need to get SERIOUS about your supplement game. Earlier this year, Animal released their long-awaited whey protein powder, Animal Whey. 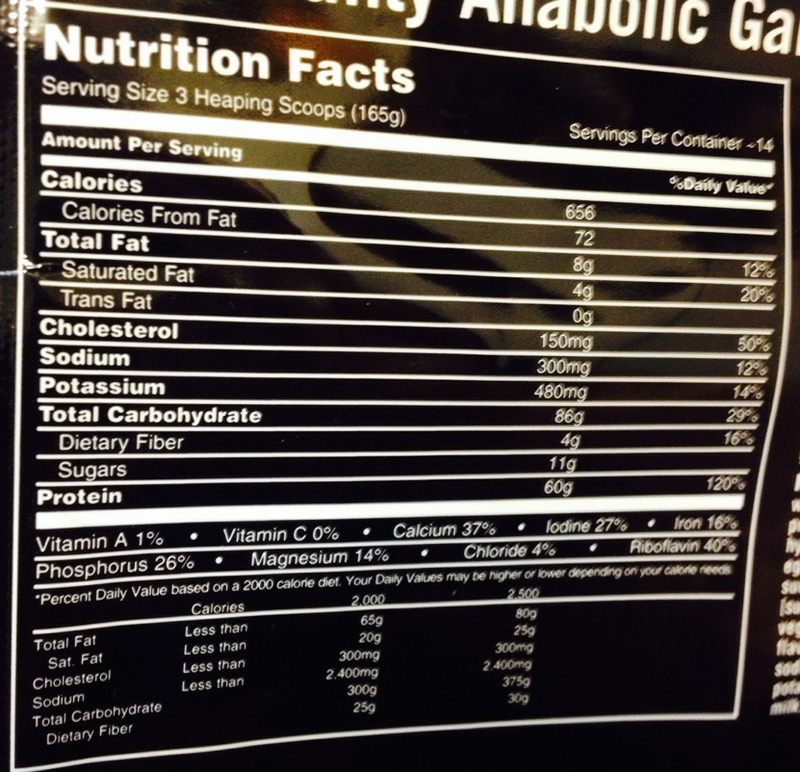 No line of protein powders or supplements in general would be complete without a serious mass gainer. Animal has finally gotten into the heavy gainer market with the all-new Animal Mass! Animal Mass packs a hefty 648 calories in each 165g serving! Whereas most “gainer” protein powders use cheap filler carbohydrates that are little more than glorified sugar, Animal Mass steps it up a bit with a combination of maltodextrin, inulin, waxy maize, and oat fiber to provide a slow and steady release of carbs into the bloodstream and not send your insulin levels through the rough the way plain sugar would. While three of the four ingredients Mass uses in its carb and fiber blend seem relatively familiar (malto, maize, and oats), inulin may be a new one. Inulin is combination of fructose polymers found in plants. The upside to including inulin as part of a carb blend, is that they aren’t digested in the upper GI tract, meaning they have a reduced caloric impact on the body. Furthermore, they don’t spike insulin levels or cause a rise in blood glucose, in addition to stimulating the growth of healthy bacteria in the gut!. This is a protein powder at its core, and as such, Animal uses a relatively standard selection of proteins to include in their blend, incorporating: ultra-filtered whey protein concentrate, cross flow micro filtered whey protein isolate, hydrolyzed whey protein, milk protein concentrate, micellar casein, and instant egg albumin. The result is 60g of high quality protein in each serving of Animal Mass. By incorporating, a mix of slow and fast digesting protein, you’ll have a long and steady release of amino acids into the bloodstream, helping to keep your body in a constant anabolic state and keeping you feeling fuller as opposed to only including rapid digesting proteins, such as whey. Note that due to concentrate being the first ingredient (like most weight gainers), this product is not going to be for the lactose intolerant or lactose sensitive users out there. To ensure you’re meeting all of your macros, Animal includes a mix of healthy fats (8g per serving) that supply the much needed essential fatty acids (EFAs) in the diet. Animal Mass contains MCT powder, sunflower oil powder, and flaxseed powder to make sure all of your nutritional bases are covered. However, no matter how “healthy” a protein powder may be, it’s a moot point if your body has a tough time digesting it. Animal includes both papain and bromelain (the same 2 enzymes seen in Animal Whey) to help break down those complex strands of protein and “tenderize” them, so you’ll reap all the nutritional benefits Animal Mass has to offer with no unpleasant GI distress. 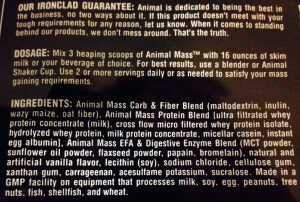 Animal Mass’s ingredients thankfully don’t include any cheap fillers like free form aminos (like glutamine) or hydrogenated oils. The good news here is that there are no “cheap fillers” in the form of partially hydrogenated oils, non-dairy creamers, or free form amino acids. Many protein powders and mass gainers enlist these nutritional pretenders to make their protein have a better taste, texture or nutritional profile. Further, one reason we normally don’t like weight gainers is because of the amino acid spiking that goes along with them. For instance, the tons of glutamine, glycine, taurine, and creatine added to other mass gainers may sound good (and we do in fact love those ingredients), but they also get added into the protein calculation. 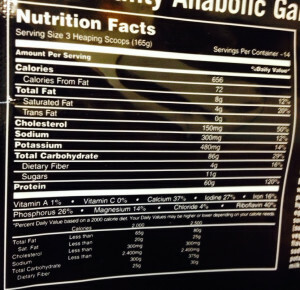 This means that you don’t know how much actual dietary protein (such as from whey) is inside of those weight gainers. And when you’re looking for a weight gainer, we want calories above those extra free form aminos – so we’ll take a spike-free gainer when buying one. Thankfully, this has been the trend in new gainers lately, and Universal follows suit. Animal Mass rounds out its ingredients with natural and artificial chocolate and vanilla flavors, lecithin, xanthan and cellulose gum, carrageenan, acesulfame potassium (Ace-K) and sucralose. 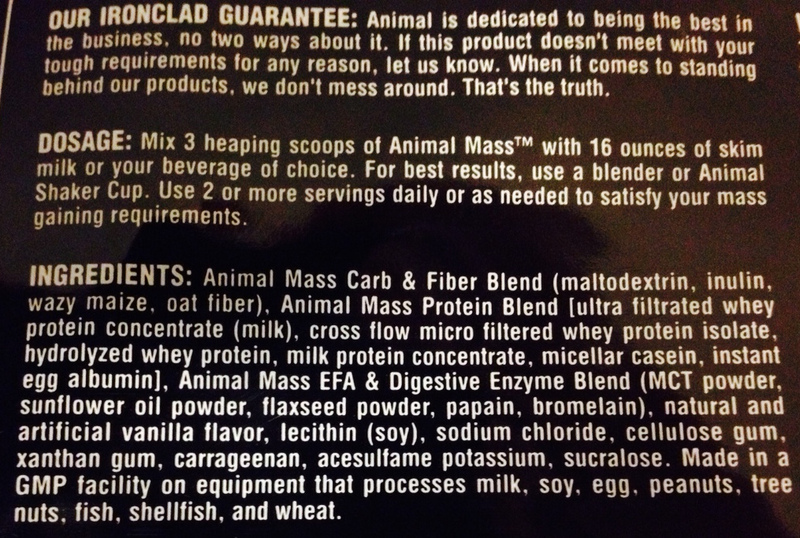 Animal Mass comes in 3 standard flavors universally accepted in the protein powder world: Chocolate, and, Vanilla. There are no trial sizes or 2-lb tubs options when eating like an Animal. 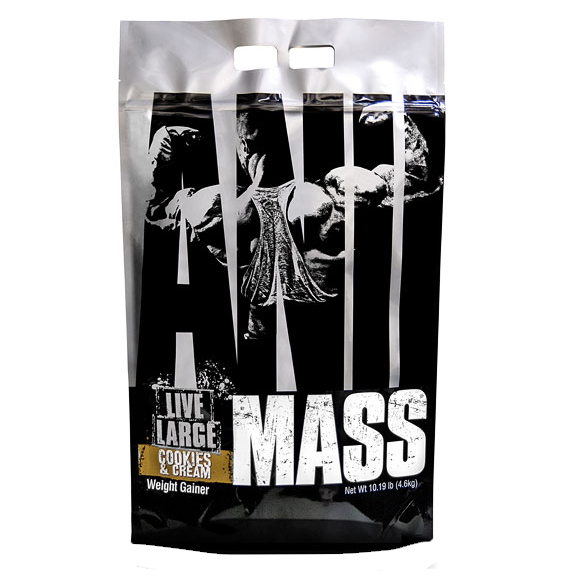 Mass comes in either a 5-lb or 10-lb bag. Animal Mass is finally here, and with we can hear a resounding “THANK YOU!” from the Animals out there. The wait has been long, but Animal made it worth our while. They’ve formulated a product that not only helps hit your high calorie goals when bulking, but uses high quality ingredients to not wreak havoc on your insides. We do have to say, however, that there is nothing new or innovative in Animal Mass. Sometimes the best thing is that they didn’t add a ton of junk (like glutamine and other free form aminos). This is exactly what was expected from the same guys who made Animal Whey – something simple for the Animal followers who just want to blast calories in without concern. No Comments | Posted in New Products, Supplement News | Tagged Bromelain, Egg Whites, Flaxseed Powder, Inulin, Maltodextrin, MCT Oil, Micellar Casein Protein, Oat fiber, Papain, Sunflower Oil Powder, Universal Nutrition, Waxy Maize, Weight Gainers, Whey Protein, Whey Protein Hydrolysate, Whey Protein Isolate.